As a grade-schooler in the late 1950s, I remember being delighted by this idiom, sometimes adding jelly bean at the end as an intensifier (Peachy keen, jelly bean!). But even then, I also recognized in a way I couldn’t quite put my finger on it, there was a faint sense of sarcasm hovering above the phrase despite its otherwise positive meaning, and by now it’s almost impossible to use the idiom peachy keen without summoning at least some notes of irony or condescension. Dad: Hey kids, this weekend we’re going to visit nana and grandpa. The Eldest: Wow. Peachy keen. We can hardly wait. 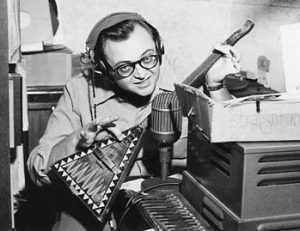 Hawthorne’s ever-increasing popularity was due to him being a progenitor of what was soon dubbed “free-style” radio – a way of hosting that in Hawthorne’s case featured his original, always humorous, sometimes wacky, break-the-rules broadcasts that featured the use of West Coast Teen-Bop-Beatnik slang. I mean, can you dig it, daddy-o? Neat-o! By attaching jelly bean after the words peachy keen, this two-part idiom also became a rhyming figure of speech, like see you later, alligator – after while, crocodile and till today youngsters are still delighted by this kind of nonsensical wordplay. If readers still can’t quite get what the use of peachy keen was reserved for, below is a series of peachy-worthy people and things. 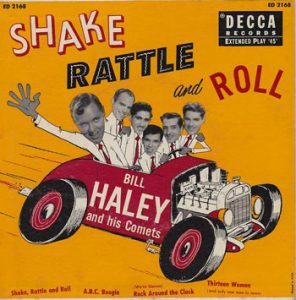 Bill Haley & His Comets 1955 10” LP Shake Rattle and Roll. 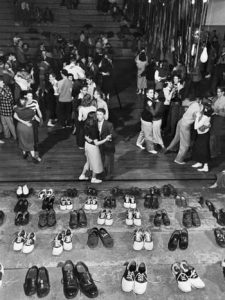 A 1950s “sock hop.” Teens would remove their shoes so as to not scuff the gymnasium floor. 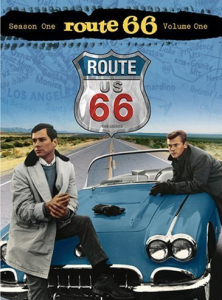 Route 66 (1960–1964), a much-watched TV series featuring two buddies on the open road. In each episode, as they traveled across America, the lads worked on new jobs and became involved with new people and their stories. Oh yeah, and at the start of every season, they drove a shiny new Corvette. Peachy keen, all right! This entry was posted on Thursday, August 11th, 2016 at 2:45 pmand is filed under . You can follow any responses to this entry through the RSS 2.0 feed. You can leave a response, or trackback from your own site. This was the favorite expression of a girl I knew 35 years ago. Only she would say ‘peachy cream’. I made sure not to correct her but it was difficult to keep a straight face at times.